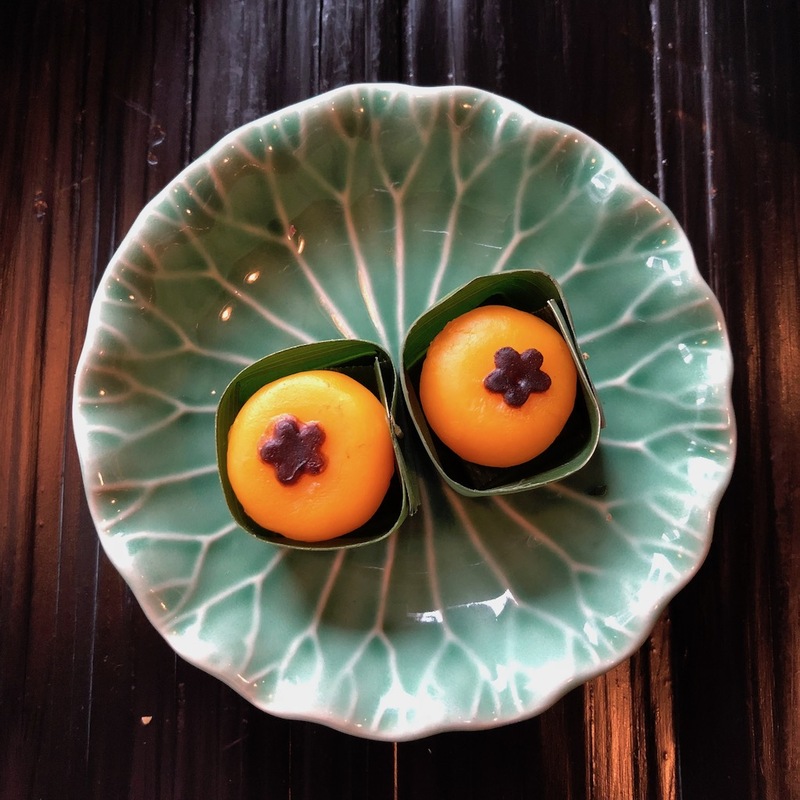 Visitors looking for afternoon tea in Bangkok are spoilt for choice, as not only do the majority of the city’s high end hotels offer high tea of some kind, there are many cute little independents who’ve also got in on the trend. 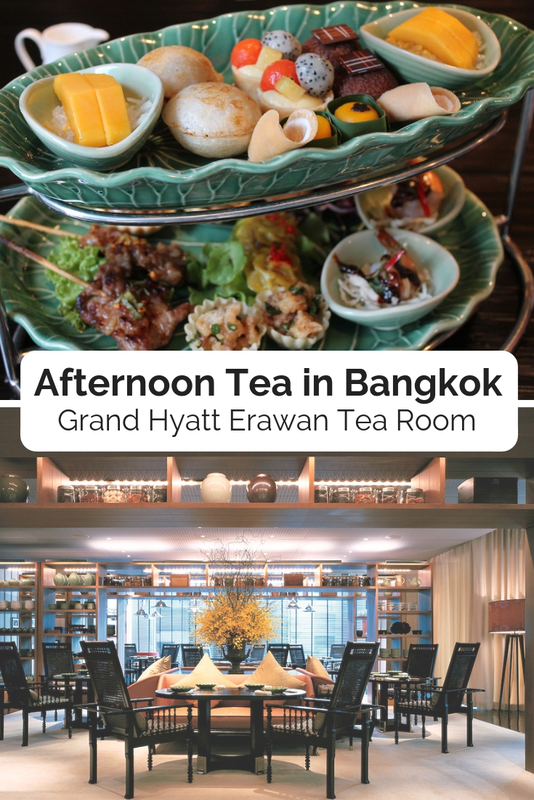 However, during my recent trip to the Thai capital the one that really caught my attention was afternoon tea at the Grand Hyatt’s Erawan Tea Room. 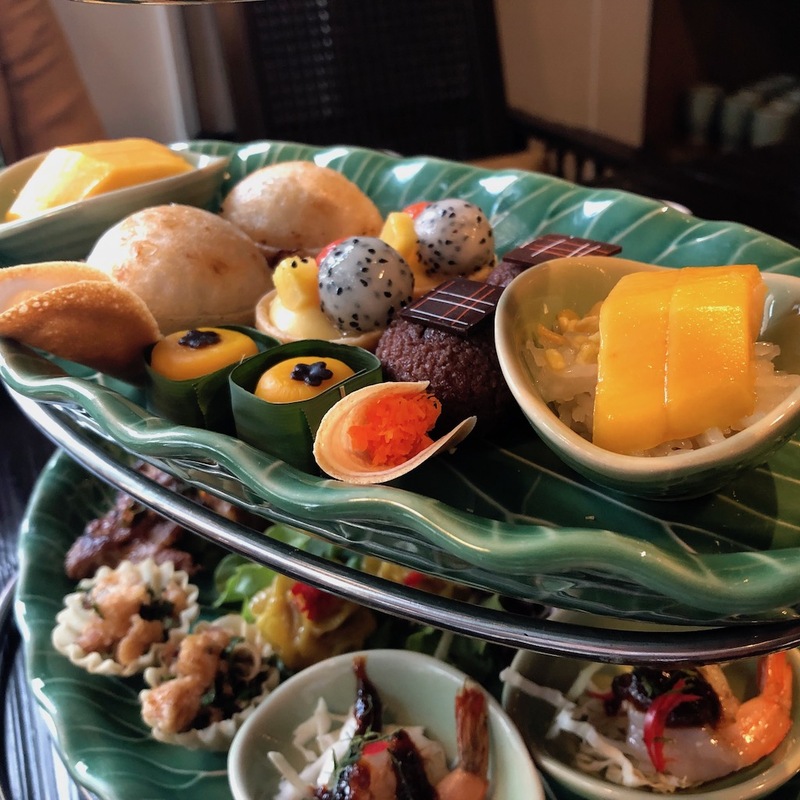 This was because the tea room actually sits right above the city’s iconic Erawan Shrine, giving you a super special setting for your afternoon tea. 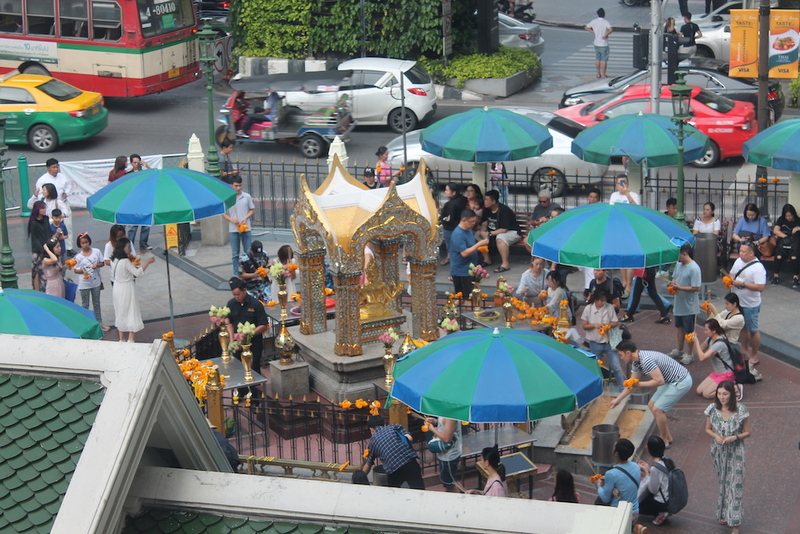 One of the Grand Hyatt Erawan’s nine restaurants and bars, the Erawan Tea Room is slightly oddly placed in order to have this view. It isn’t actually inside of the hotel, but rather in the adjoining Erawan Bangkok Mall, set amongst designer stores such as Mulberry and Lanvin. 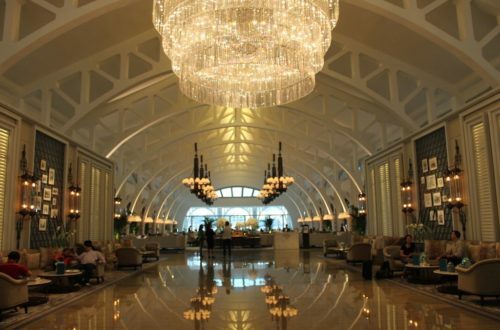 Being inside a shopping mall at first takes a little from the tea room’s grandiose, but once inside you’ll completely forget that beyond those doors is a bright, sterile and bland shopping mall as you’re whisked away to a different world. 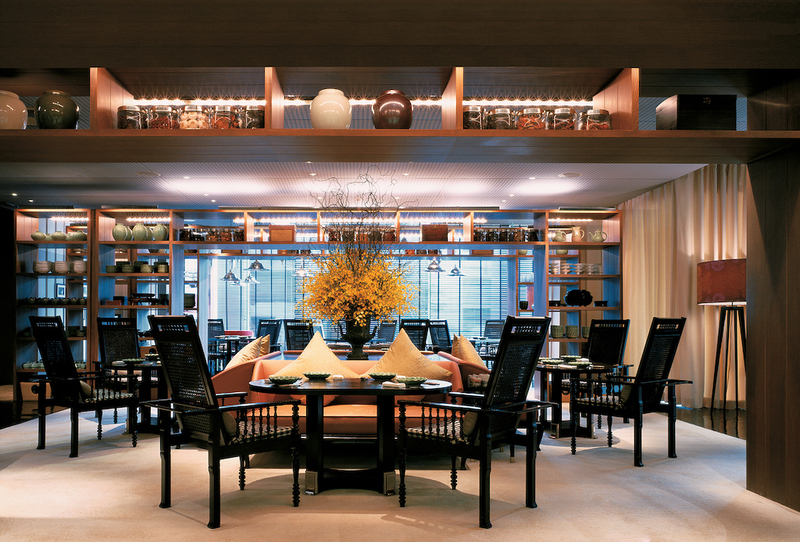 The tea room is given a very sophisticated, stylish feel thanks to its low lighting, dark wood and Japanese design. We were quickly greeted by staff by the door and taken to what I think was the best seats in the house, looking right over the shrine. Our hosts were friendly and attentive throughout, quickly providing us the drinks menu and were always close at hand. Guests can choose between a selection of flavoured iced teas, coffees and hot teas, including classic western and local Thai flavours. This included lemongrass, pandan and Thai ball fruit and pandanus. After spending the morning out in the heat of Bangkok I decided to veer away from my usual tea choice, instead picking a refreshing iced tea over my usual hot cuppa. It had a very strong flavour, which took a little while to get used to – quite the opposite from Justin’s pot of Breakfast Ceylon which although tasty, was rather weak. Take home a piece of the Erawan Tea Room! Another reason I’d chosen the Erawan Tea Room for my afternoon tea in Bangkok was because they offered a Thai afternoon tea, rather than the traditional ‘English’ fair. 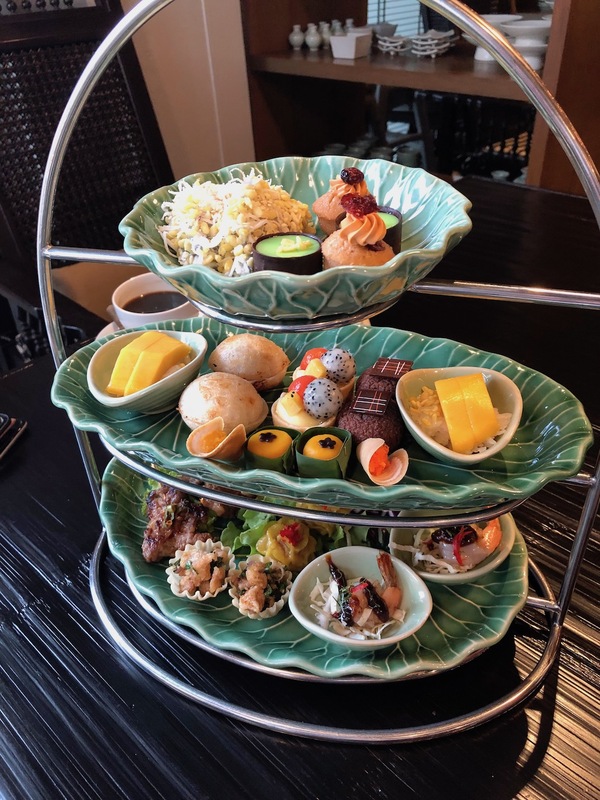 After experiencing the Fullerton’s Heritage afternoon tea in Singapore I’ve always been keen to try afternoon teas with a local twist, and so this menu, along with the view, pushed the Grand Hyatt to the top of my list of high teas in Bangkok to try. Our food came quickly and was beautifully displayed on a three-tied tray. Over recent years I’ve become more of a fan of the savoury delicacies that the sweets (I know, crazy, right?!) so I was excited to dive right into the first part of the tea. The savouries were made up of crab dumpling, prawn salad with lemongrass and chill paste, grilled pork skewer, chicken with mixed with thai herbs in a crispy basket, deep-fried chicken roll and beef massaman tart. 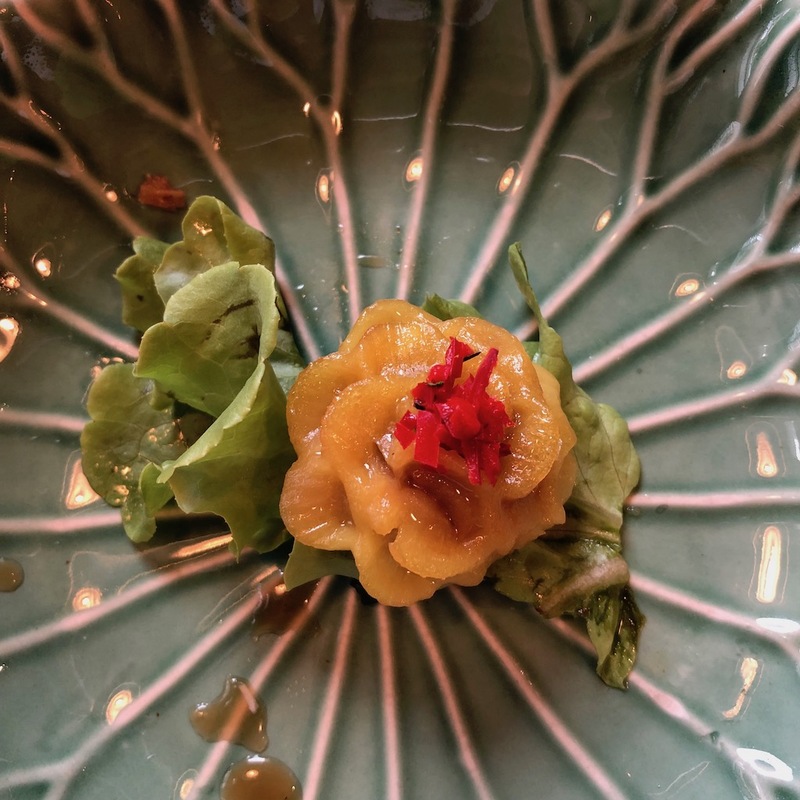 Some, like the crab dumpling shaped like a flower, looked just too pretty to eat! The majority had a slight spicy kick, which I adored, but nothing was too overpowering. 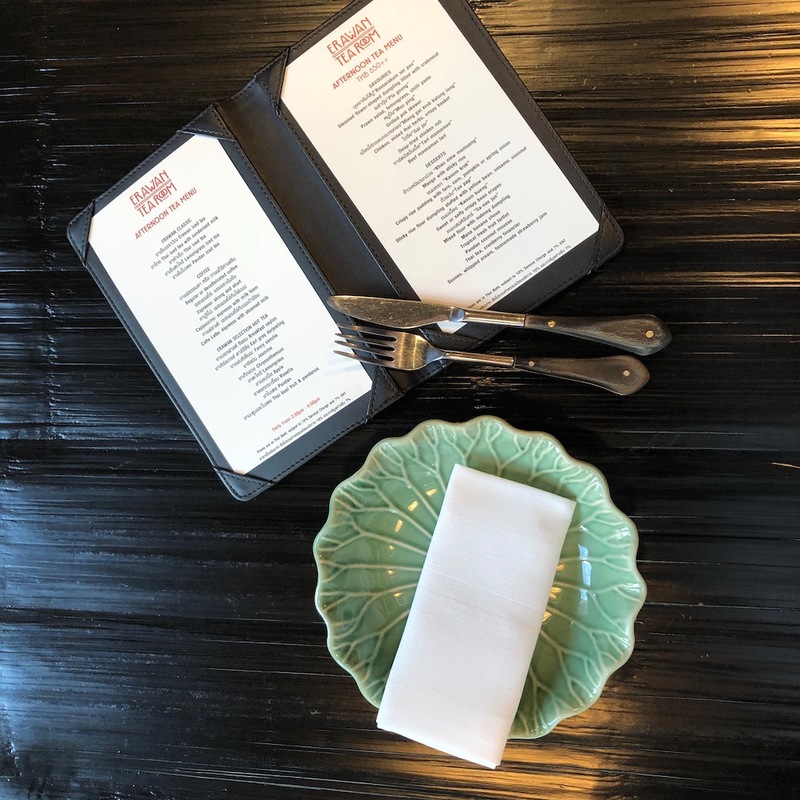 My personal favourites were the deep-fried chicken roll and the beef tart – the chicken was hot and fresh, similar in taste to a Thai fish cake, while the warm, soft, spicy shredded beef was absolutely delicious on top of its thick pastry case. I could have had seconds! I’ve come to not expect much from scones in Thailand, as nothing can beat a large, warm English scone in my opinion. However, these weren’t too disappointing, albeit rather on the small side. As is almost always the case in Asia, rather than clotted cream the scones came with whipped cream, but this was made up for by the delicious homemade strawberry jam from Chang Mai. Finally I moved onto the desserts. Now I have to be honest and say that although I love Asian savoury dishes I find their sweet offerings a little bit odd for my palette. Still though, for someone who’s generally not a huge fan of these flavours and textures I did think the mini dishes on offer were quite nice. The desserts were made up of the classic Thai dessert mango with sticky rice, a pandan coconut mousse, a sticky rice flour dumpling stuffed with yellow bean, sesame and coconut, sweet and salty crispy bean crepes, mixed flour and nutmeg dumplings, a crispy rice pudding with taro, corn, pumpkin and spring onion, a Thai tea and cranberry financier, a mana banana chop and a fruit tartlet. The sweet and savoury mixtures were the oddest for me. The sticky rice flour dumpling was gloopy and was so weird with a sweet taste mixed with the flavour of spring onion. I’d never tried anything like it before. The crepes did go down well though, sweet and salty, they had a nice crunch, but me and the stuffed dumplings didn’t get on too well. Favourites in the dessert selection included the pandan coconut mousse, with its light texture and crisp chocolate case and the fruit tartlet was deliciously fresh, with the custard filling topped with dragonfruit, watermelon and mango. 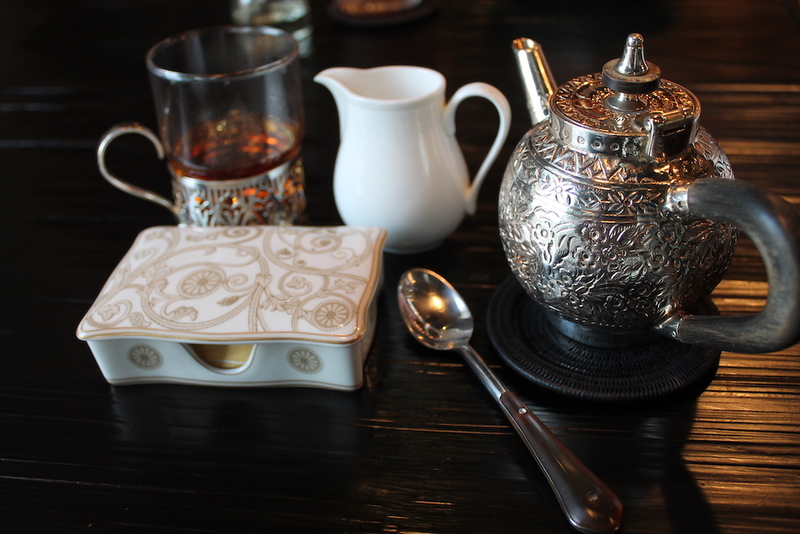 Overall I really enjoyed my experience at the Erawan Tea Room. 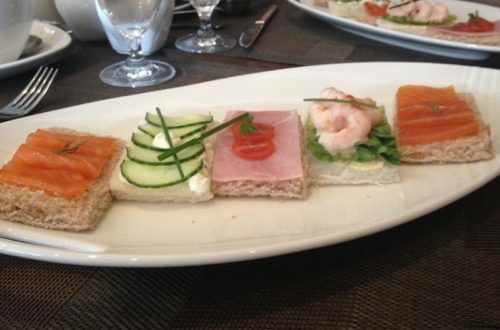 The setting is special and the service great – I loved that throughout our visit our drinks were regularly topped up, without us ever having to ask. 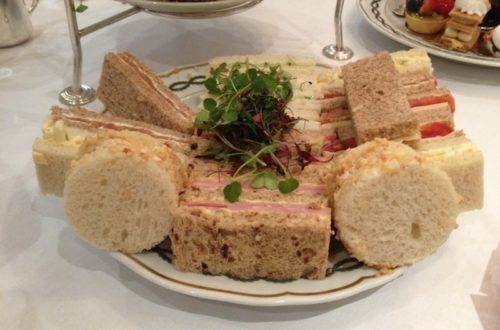 Although not all the items on the menu were to my liking (personal taste rather than bad food I have to add) I particularly loved the variety and number of dishes that made up the afternoon tea. I felt there were many more options than I’d seen in other places, so a big thumbs up from me there. But the icing on the (Thai tea) cake has to be the price. Afternoon tea at the Grand Hyatt Erawan Tea Room costs just 650 baht (approximately £15) plus a 10% service charge and 7% tax. If you’re looking for one of the best afternoon teas in Bangkok, then I highly recommend a visit here. 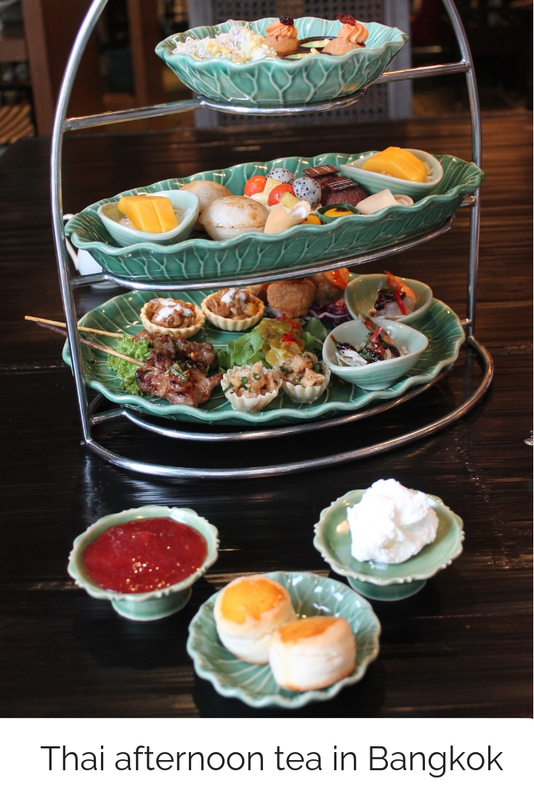 Afternoon tea at the Grand Hyatt Erawan Tea Room is available daily from 2.30-6pm. It’s a pretty children-friendly place I think, well worth a return trip! This sounds AMAZING! Worth hopping on a plane for!